Not a lot of thanks-giving after OPEC’s Nov. 27 meeting | Science. Tech. Journalism. Not a lot of thanks-giving after OPEC’s Nov. 27 meeting – Science. Tech. Journalism. Analysts are already talking about the possibility of a continued fall — to a chilling possible $40 per barrel —which harkens back to the price drop of 1986 when oil dropped to as low as $10-15 per barrel, a 67% plunge that rippled through the global market. When the World Petroleum Congress met in June, energy stocks including Exxon’s were at a 2014 high, but since June oil prices have dropped 38%. The 18% loss in November was the biggest monthly fall since 2008, and following OPEC’s meeting oil prices fell 12% for the biggest one-day drop in three years. Exxon’s stock price suffered two sharp drops since August: a low Oct. 14 at 90.55, and Friday at 90.54 for a three-month low. The company’s all-time high was 103.25 June 16. Early November energy companies started reflecting the drop in global oil prices, but Exxon survived the slump with profits that rose in October even as stock prices fell. Their second quarter earnings were considerably higher than last year, $920M higher, and third quarter profits were $200M higher than the same quarter last year. With projects in oil drilling, natural gas extraction, oil and gas transport by pipeline and ship, chemical production and refining, ExxonMobil was the second most valuable publicly-traded company behind Apple until Microsoft surpassed it in November. 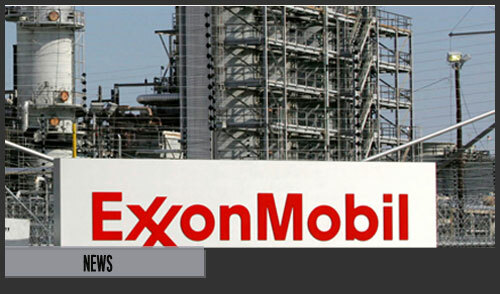 Exxon Mobil was formed in 1999 when the two oil giants Exxon and Mobil merged, one of the largest mergers in stock market history until talk this year of a Baker-Hughes–Halliburton deal. In 2014 Exxon completed a multi-billion dollar upgrade to its Baytown, Texas refinery including an ethane cracker which will supply downstream chemical processing with ethylene feedstock. In May, the first cargo shipment of liquefied natural gas (LNG) was shipped from Exxon’s $19 billion project in Papua New Guinea, and the operation was credited with an 8.4% increase in that country’s gross domestic product. Exxon is also targeting the Scarborough gas field in Australia with a floating liquefied natural gas vessel, and it is involved in the Alaska LNG project in cooperation with ConcocoPhillips, BP and pipeline company TransCanada that is projected to be one of the world’s largest. Global geo-politics hit home with Exxon in October, when a dip in stocks resulted from the company’s involvement with Russian state-owned oil company Rosneft in an Arctic exploration well in the Kara Sea off the northern coast of Russia. When sanctions called for cessation of all business with Russian companies by Sept. 26, Exxon filed an extension for additional time to wrap up operations on the University-1 (Univeristekaya) drilling rig. The area north of the Arctic Circle is rich with undiscovered oil, natural gas, natural liquids and petroleum according to a Forbes analysis of U.S. Geological Survey data. The exploratory Kara Sea rig struck a 1-billion barrel discovery on Sept. 27. However, Exxon and Rosneft this week cancelled contracts with a Norwegian company for four service vessels as the company is pulling back from a flooded market and considering future moves in the wake of economic sanctions. Also this year the company completed construction of a 10,000-person capacity office park in Houston, Texas, which realtors expect to affect the local Woodlands real-estate sub market. The complex will open in 2015, but CEO Rex Tillerson said the company’s corporate headquarters will remain in Irving, Texas, separate from its south Texas operations. In 2009, ExxonMobil bought Fort Worth-based XTO energy, a hydraulic fracturing company. Exxon is the country’s largest producer of natural gas. In January shareholders asked the company for information on its consideration of risk and the environment with regard to its fracking operations. The company ultimately answered the request with the release of a study of hydraulic fracturing risks on Sept. 30, which it promoted on its website. A controversial move by the company’s CEO Rex Tillerson, who filed a law suit in February to keep a water tower for servicing a nearby hydraulic fracturing site from being built near his Texas ranch, earned him a round of bad press and correlated with a drop in the company’s stock prices. But after an initial slump prices turned and steadily rose until July, when it began a downward spiral that hasn’t let up yet. At the State of Energy luncheon held by the Greater Houston Partnership Oct. 6 CEO Tillerson called the current energy situation “a transformative moment in the history of energy,” according to an article on offshore-mag.com. The article says he also projected that deep-water production will grow 150% and global energy demand will increase by 30% by 2040, calling for a need for policy that will reduce price volatility and international tensions. In August, the company announced the retirement of its chief financial officer/controller P.T. Mulva and that D.S. Rosenthal would be his replacement. The new controller as well as a new VP of investor relations Jeffrey J. Woodbury were announced via press release. In January, Exxon Vice-president S.D. Pryor will retire. Exxon listed a 2013 profit of $32.6 billion dollars, with top executives earning between $10-$20 million. The company’s profit last year was big, but not as big as the $44.9 billion it reported for 2012. Depending on how lucrative midstream operations are in the final quarter, the company could be on track to land above its 2013 profits. Produced for a graduate business journalism course in which the assignment was to shadow the company through the stock market and headlines and report on peaks and dips, success and failure, and keep tabs on “the bottom line”. This entry was posted in Energy & Environment. Bookmark the permalink.